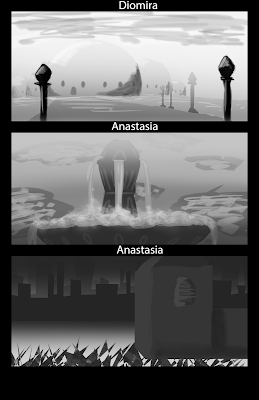 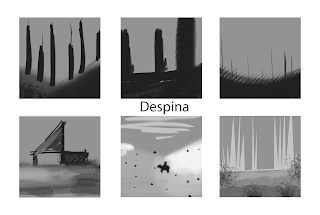 In class we were tasked with trying out more methods of creating thumbnails, the first was the use of 'Value' which means to use the entire range of grey to create a sense that what is supposed to be in the distance actually looks far away. 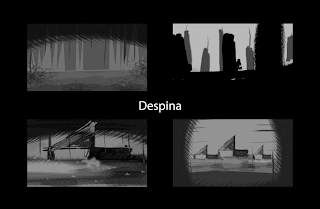 Second we looked at using quick, non-thinking methods in order to get ideas down as quickly as possible, we had around a minute per thumbnail. And lastly we were tasked with grabbing the thumbnails from the previous practice and layering them atop each other while using blending effects to create new thumbnails from old ones.